Police say a school bus was struck on the side by a pick-up truck in Alliston Wednesday morning. No students were on the bus and no one was injured. It happened around 9:45 am on Tottenham Road at Douglas Drive. Police say the bus was northbound when a black pick-up truck, also going northbound struck the left side. Both vehicles stopped and the drivers spoke with each other but then the driver of the pick-up left before police arrived. 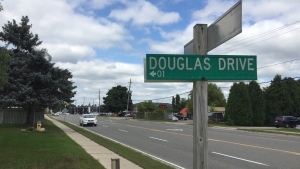 Police are looking for a black pick-up truck likely with damage on the right side and a woman in her mid-fifties with black shoulder length hair who was driving. There was slight damage to the left side of the bus. Anyone with information is asked to call Nottawasaga OPP.